Last week I made a number of these cute paper flowers to decorate a tower of decadent, vanilla cupcakes. These adorable paper flower cupcake toppers are the perfect addition to a sophisticated baby shower! Although I made these flowers in blue, they can easily be made in pink, purple, orange, yellow – really any colour you can think of. Here is a quick 6-minute video tutorial for these easy DIY Paper Flower Cupcake Topper. This is my very first video tutorial so bear with me through the tutorial. With carpel tunnel in both my hands due to the pregnancy (7 more weeks to go – yay! ), my fingers are super clumsy right now. Isn’t it a wonder how much we rely on the feelings in our fingers when we type, or grab things, or just to know where our hands are spatially in relation to the other hand! I can’t tell you how many times I’ve cut myself lately…Otherwise, I loved making this video tutorial because it was so fun to make and easy to edit! 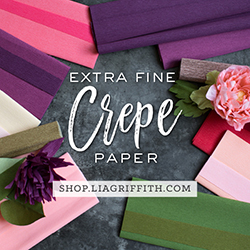 You will need 1 strip of primrose yellow fine single-sided crepe, 4″ x 1/2 “, fringed half way, 4 white double-headed stamens (I used small hammer-headed stamens), 5-petal strip of blue crepe paper, 3″ 20-gauge floral stem, floral tape, scissors, and pliers. Fold the double-headed stamens in half and attach 2 folded stamens at a time to the floral stem with floral tape. Wrap the strip of fringe around the attached stamens, 1/2″ below the stamens, and secure with floral tape. Using your thumb and forefingers, cup each petal, and then gather the bottom of the petal strip. The gathers will let you adjust how close or far apart you should adhere the petals to the stem wire. Wrap the gathered strip around the stem wire and secure with floral tape, ensuring that only the fringe is showing, and not the floral tape that is securing the fringe. Use a narrow tool, such as a pencil or 16-gauge stem wire, roll the edges of the petals downwards. Cut the stem wire until only about 1″ is remaining. Slide the stem wire into the top of the cupcake, push down to secure as necessary. *Again, I am using fine crepe paper, although heavier crepe like 180 grams should do the trick as well. **For the 5-petal strip, I used a template similar to the one included in the book, Paper to Petal, by Rebecca Thuss and Patrick Farrell, so I honestly cannot take credit for the template (the authors offer a .pdf download for the templates in the book) or the gathering technique. You can create your own similar template, based on the size of the flower you want to make.